Four hundred years ago, although Maney was only a small hamlet, separated from Sutton Town by the valley of the E Brook, the inhabitants took an active part in Sutton Coldfield affairs. Several of the Wardens (the Warden was effectively the Mayor of Sutton) were Maney men - George Heath was Warden three times, Simon and Christopher Veysey of Maney Farm and Henry and Raphael Sedgewick of Wylde Green all served their year as Warden in the first half of the seventeenth century. These were the yeomen and gentry of Maney, but the big house, known as Maney Hall, which stood opposite Bodington Gardens, no longer housed the top gentry; Christopher Veysey’s widow was the tenant of Maney Hall in 1638. George Heath and Christopher Veysey both witnessed the will of their neighbour Edward Cockersole, made as he lay “sicke in body but of good and perfecte remembrance” in his Maney farmhouse in March 1625. It is a short will; he bequeaths forty shillings each to his two surviving children Raphaell and Margaret, everything else to “Mary Cockersole my welbeloved wyfe”. Margaret was thirteen and Raphael eight in 1625, another son, John, having died in infancy. Widow Mary lived for another fourteen years, but Raphael died aged nineteen, so this line of the Cockersoles died out - the Cockersoles who lived in Maney later in the seventeenth century were a different branch. In order to prove the will, an inventory of Edward’s goods and chattels had to be presented to the Bishop’s court at Lichfield. This was compiled on May fourth 1625 by “George Heath gentleman ChristopherVeysey yeoman and John Fletcher”. 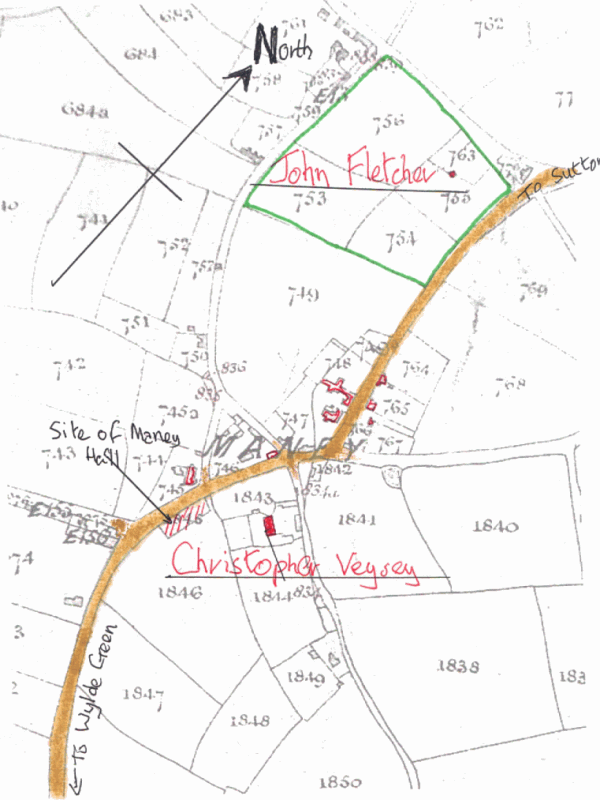 John Fletcher was the tenant of property belonging to Emmanuel College, “a house and orchard with four closes adioynynge beinge arable and pasture and joyninge to Birmingham lane East” measuring twelve and a half acres. This land was bounded by Manor Hill, Driffold, Bishops Road (not then in existence) and Birmingham Road, with Fletcher’s house lying back from Manor Hill in its orchard - the whole of this property is now bisected by a deep railway cutting. The inventory of Edward Cockersole’ goods and chattels appraised by these three neighbours is rather brief and incomplete - the total value of the items listed is only £10.14s.0d, but the appraisers claim that the goods were worth £41.13s.10d. They account for farm animals - cattle, sheep and a mare worth eight pounds - and corn growing in the field worth fifteen shillings, so thirty pounds worth of goods are unaccounted for. Perhaps he had a trade with valuable equipment and materials, or he may have been owed the money. This detail of the 1824 Corn Rent map of Sutton shows the Maney area almost unchanged since 1625. Birmingham Road is coloured brown, Fletcher’s property is outlined in green, and the probable site of Maney Hall is shown. Cockersole and Heath probably lived in houses near Maney Corner.